It’s no surprise that a drama’s finally hit on this concept. And to be fair, the continuing woes over the middle classes in suburbia aren’t exactly original fodder either. In Perfetti Sconosciuti by Paolo Genovese, there’s an eclipse coming and to celebrate a group of 7 friends are having dinner together. Wisely acknowledging that all phones disrupt any kind of social engagement, one of the hosts suggests everyone places their phone on the table and if they ring or texts / emails come through, it all gets shared with the party. Goaded under the mantra that nobody has anything to hide, the group agrees – albeit reluctantly in some cases. However, unsurprisingly, secrets abound at this table as this social Russian roulette begins – with domestic dark clouds looming…. Genovese’s drama may be an unoriginal concept, but its execution and delicious premise are nothing short of slick and confident. The cast of Italian favourites (mostly unknown on these shores) make each of their characters feel eminently likeable in the run up to the dinner party, and each of them has their own foibles waiting to be hoist upon the table. There’s a newly married couple barely to stop touching each other, a permanent bachelor friend who finally has a date, a couple who appears strained – these are all people who have something to lose (why they even agree to this madness is wisely never fully discussed). As the inevitable twists begin to play out and the truth creeps closer to the surface in many relationships, Genovese’s adroitness with the camera and handling of the revelations is masterful and manipulative in equal measure. Shocks and deep sudden intakes from the audience are inevitable – and at least one reveal surprises in its casualness, but there’s a lot of discomfort and wriggling around in seats to be elicited from this execution. While it’s to the ensemble’s strength that nobody feels on more morally higher ground than the other, equally none of them feel eminently dislikeable as events progress during the night (though one does feel it’s a little first world problems of the middle class at some points). 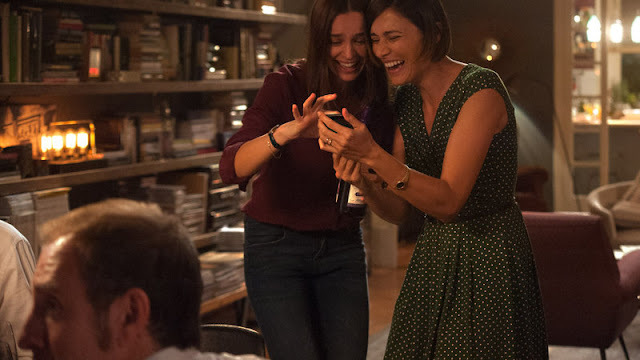 Unfortunately in the final run, it risks a reveal too far but it’s a testament to how engaging the cast are and perhaps how close this social experiment may cut to the bone with many that Perfetti Sconosciuti is such a middle-class crowd-pleasing / what would you do resounding success.